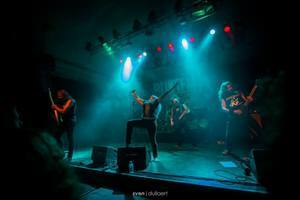 Three Belgian bands on a very busy metal night! Slayer plays in Belgium, there’s also Diablo Fest and Ostrogoth is playing too … so there’s choices to be made tonight. One thing’s for sure: this is the event in one of the most beautiful clubs in Belgium. This place is really wonderful, in the middle of town, with a nice little park behind it and a wonderful atmosphere inside. 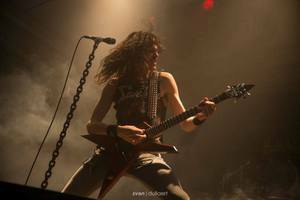 Almost a hundred metal fans found their way to the Casino and enjoyed some earsplitting metal. MEGASONIC opens and considering this is only their third public show, they go down a storm. The audience enjoys their ballsy but melodic songs and the band gels like it’s been on the road for weeks. They play a selection of their debut album ‘Intense’ and the public response is overwhelming. This band rocks! 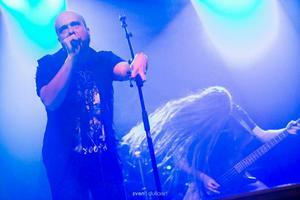 BLIKSEM has already made its name on the metal circuit and plays trashy and fast to almost doom-like music. Singer Peggy Meeuwsen is a great vocalist but uses her fantastic voice in a way that hides her great bluesy tone in favor of an aggressive metal scream. The band plays a good set, the audience likes it. Overall it lacks a bit of quality to the songs which is compensated by the musicianship of the band.